In case you've been living under a rock or are altogether confused about what day it is, today's the 10th anniversary of the terrorist attacks of September 11th, 2001. Everyone who remembers that day remembers where they were, what they did, the anger, fear, and hopelessness that they felt. They remember the iconic images of first responders who put their lives on the line in an attempt to help the victims. But what's missing from many of those images are women, especially women of color. While thousands of people ran away from the collapsing towers, New York City Firefighter Regina Wilson ran toward them. Wilson, who is black, is one of 11,000 women who serve as firefighters nationwide, and was one of the first responders at the scene of the World Trade Center on September 11. No one was sure of what was happening, who was attacking New York, or whether the threat was ongoing. All she knew was that her help was needed. BET reports on her harrowing experience that day. "Keep going. Run. Run. 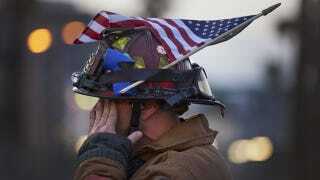 Run," her boss instructed her and the other firefighters. The group ran back to their fire engine parked only five blocks away from the towers, and as they quickly put on their oxygen masks Wilson looked back only to see "black smoke, with flames in the smoke." It wasn't long before the black smoke encompassed them, too. "It got completely black and we were sitting there for what felt like forever. At that point, I just got content with dying because I didn't know if the buildings were going to fall on me. I didn't know if people on the ground were going to be shooting at me," she says. Wilson donned an oxygen mask and worked tirelessly with other first responders to discover survivors in the rubble. Seven members of Engine 219- Wilson's engine- lost their lives during the effort. Wilson is grateful for the sacrifices of everyone who put the safety of strangers before their own, but hopes that the contributions of women, and especially women of color, aren't forgotten. "I think one of the biggest things that I hope for is not even so much as an African-American woman, but as a woman, period, that people will be able to see our own personal sacrifices, and that history will show that men were not the only protectors of the city, but there were women there, too," she says. "We were here trying to serve our country. We were there trying to protect our neighbors and our neighborhoods. I think that I don't want history to exclude that in the things that have been done with Ground Zero." Regina Wilson still serves as a firefighter in Engine 219. It showed me how selfless you have to be, how much you put other people before yourself. A lot of these first responders put strangers before their families and it just gave me the true essence of what it means to really love people.